There was so much life in Simma Holt that it’s hard to believe she’s gone. The journalist, author, and former member of the House of Commons died in Vancouver on Jan. 23. She was 92. She worked at the Vancouver Sun for 30 years and made a name for herself as an intrepid reporter at a time when there were few women working in the profession. She also wrote for the Toronto Sun, Ottawa Sun, Vancouver Business, Reader’s Digest, Maclean’s, and other publications, and was a talk show host and frequent guest on radio and television. We are so sad to lose her, but her spirit and her shiny stories will be remembered forever. She was the author of five books, the last one being “Memoirs of a Loose Cannon,” a personal memoir whose title refers to her legendary outspokenness and forthrightness. Although she was tough and feisty and never afraid to call a spade a spade, Holt was also known for her compassion, and was a social crusader most of her life. “I was born to care,” she said at the launch of her memoir at Library and Archives Canada in 2008, going on to explain that her philosophy of life is known in Jewish tradition as tzedakah. “It’s charity. You give without people knowing you give, and you don’t look for credit. You do what is humanly right, and you have to care about other people, no matter what they are, what their skin, what their problems,” she said. 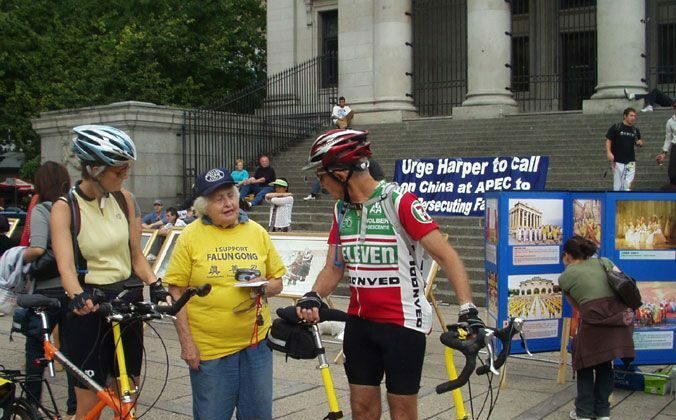 When Holt became aware of the campaign of persecution against adherents of Falun Gong in China, which was launched by the Beijing regime in 1999 and continues today, she became impassioned about stopping that injustice. “Simma was one of the strongest supporters of Falun Gong ever since she came to our protest site in front of the Chinese consulate on Granville St. in 2006 and learned who we are and why we were protesting,” says Sue Zhang of the Falun Dafa Association of Vancouver. It was in 2006 that allegations first emerged that Falun Gong prisoners of conscience were being killed for their organs to fuel China’s lucrative transplantation trade. An investigative report and several books have been written on the issue since. Ethan Gutmann, author of “The Slaughter: Mass Killings, Organ Harvesting, and China’s Solution to its Dissident Problem,” estimates that at least 65,000 Falun Gong adherents have been killed for their organs. After city hall sought a court order to shut down the Falun Gong protest site in front of the Chinese consulate on Granville Street in 2006, Holt accused former Vancouver mayor Sam Sullivan of attempting to stifle free speech and kowtowing to the Chinese regime. “There is genocide going on and the mayor is supporting genocide rather than the people of this city,” she said in a press conference, referring to the killing of Falun Gong adherents for their organs and by torture as a genocide. “They are leading the world towards a future without genocide. If there were a group like Falun Gong in 1936, the genocide [of the Jewish people] would not have happened,” she said at rally in 2009. Zhang says that in August 2012, when Holt learned that Zhang was planning to attend Senator Gerry St. Germain’s annual barbecue in Surrey—where Prime Minister Stephen Harper was a guest—she wanted to go along. “She said, ‘I am sorry that I missed the rally. I will write letters when I am better,'” says Zhang.